this model took top spot. When I was a kid, biplanes were the glamour aircraft of the era. This, of course, has led to a liking for them even when they generally don’t fly as well. 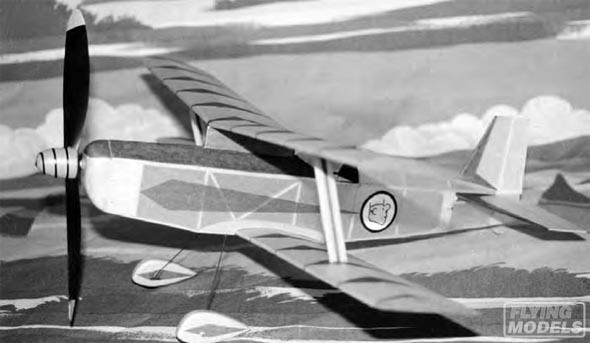 When I started building models after a long break working in various capacities in the full scale airplane world I stayed away from biplanes after a few gave poor results. In spite of their lackluster performance I thought that a biplane could have performance approaching the single wingers. 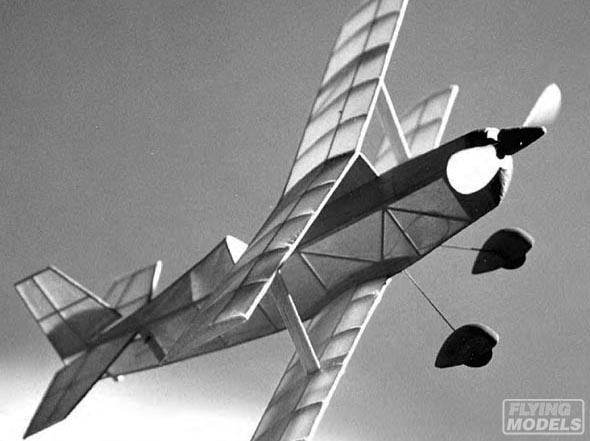 My degree in aeronautical engineering came after biplane design was eliminated from the curriculum, so I didn’t know much about theories on them. To work out a decent design, I felt it best to look at what has worked well. In this case I chose to use the features of full scale biplanes that fly well. From this perspective it was decided that a reasonable aspect ratio should be used for each wing; this should be 6:1, or more. The larger the gap and stagger the more effective the wings would be. The gap should be approximately equal to or greater than the chord of the wings if equal chord is used, or, if not, at least equal to the chord of the smaller wing. With positive stagger the lower wing should be set at a slightly higher angle of incidence than the upper. This point gets a lot of argument but it comes from my experience in sailboat racing. Those of you who have participated in this sport will realize that the top wing is rigidly held in the safe leeward position and therefore has higher angle of attack induced by the location of the lower wing. I know that this is taking a macro situation and applying the result to a micro problem, but it works. This Born Loser, with black fuselage and orange wings is the prototype built by the author, and shows signs of its extensive service life. In designing most models I look to meet a set of contest rules so there is an excuse to fly the model after it is sorted out, rather then keeping it around just because it flies. In the case of the Born Loser it was designed to the Flying Aces Club (FAC) Embryo Endurance rules. The Embryo rules encourage models with a scale-like appearance and give bonus points for cabins or open cockpits, plus wheel fairings and simulated exhausts. 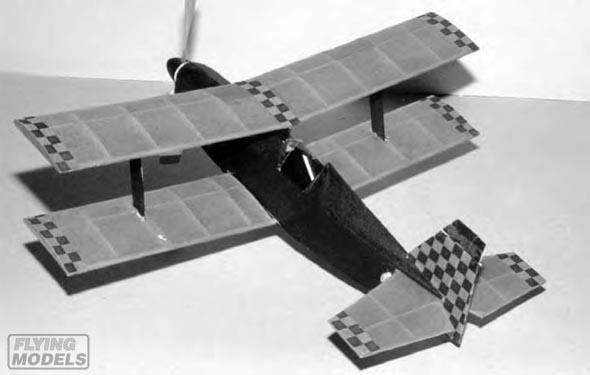 Also with Embryo rules the biplane models can have up to 70 square inches of wing area where a monoplane can only have 50. 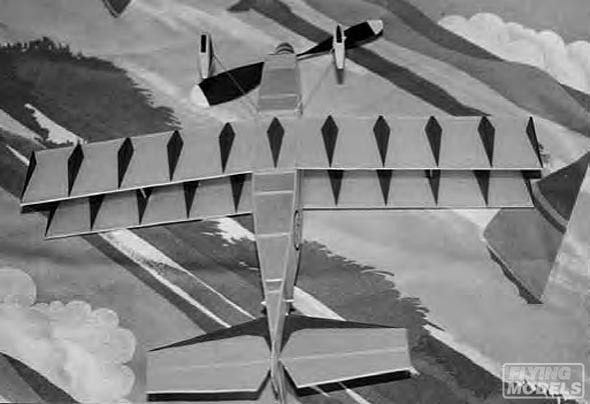 This model is not necessarily the best that can be done with a biplane using the Embryo rules but is just a good flying example of what biplanes can be. For the Born Loser I wanted something that looked like a small homebuilt biplane that might have been done in the thirties. For this reason all the surface tips were built as square cuts and the fuselage is a simple box with a triangular upper fairing. I think this has come out as planned, except that I had to increase the dihedral and vertical tail area to get the stability needed for free flight. These changes are incorporated on the drawing of course. The name "Born Loser" was chosen not because I expected the model to be bad but for the comic strip I enjoy for its innocent humor. The performance has not been in the loser category at all. My model won its first contest outing and others have reported victories or doing well with it. Construction should pose no problems for anyone who has built stick and tissue models previously. All of the structure is 1/16-inch square stock or 1/16-inch sheet except the nose block, wing leading edge, and other small parts as noted on the drawing. The fuselage is built using the two sides built over the plans and each other. The upper fairing is a simple triangle. The forward sheeting helps brace the upper wing mount pylon. In mounting the pylon care should be taken to assure that it lines up with the fuselage center line. The two wings are one piece each and identical except for the spacing of the center ribs and tissue anchors at the interplane struts. The interplane struts extend into the wings so that they can allow adjustment of wing washin or washout as needed during trimming flights. They also serve to stabilize the upper wing mounting. Builders option items such as wheel pants and spinner are not detailed as we all have our own preferences as how to do these items. The model should be covered with tissue, Japanese tissue being preferred. Lightly shrink the tissue using water and give one thin coat of nitrate dope or lightly spray with Krylon clear or matte finish. Bill Barber did this more ornate example. All have flown at a Category I indoor flying site and have approached times of one minute. The motor which Al uses is 1/8-inch Tan II about 20 inches long, and doubled. Assemble the parts with the interplane struts, leading edge of the stabilizer, and fin only tack glued. The wing and tail should be unwarped at this time. Make up a two-strand rubber motor from ¹⁄₈-inch Tan II about 20 inches long. Install this doubled, and balance the model with the balance point just aft of the spar in the upper wing. Test glide over the proverbial long grass if possible. Any grass is better than a hard surface. Set the stabilizer to obtain a steady glide. If this cannot be done add weight to the nose if the models stalls with a large nose-down stabilizer angle. When a satisfactory glide is achieved, remove the motor and install as only two strands. Wind the motor about 200 turns and release. This should produce an extended glide. If this is okay add about 200 more turns. Keep adding turns in increments of about 200. If the model stalls during the power burst with the increased turns add some more down thrust. If a tip stall occurs, break the glue tack loose on the upper wing and warp for about one or two degrees of washout. Offset the fin or crack at the spar to adjust the turn diameter. Tissue “spear points” were added to the bottom and the top of the model. Al suggests you lightly water shrink the tissue, then spray with a light coat of Krylon gloss or matte clear. Both wings are almost identical except for the center section top, with the closely spaced center ribs for the pylon. My model is set up to fly left-left and has the wings unwarped except for about one degree of washout in the upper right wing. The stabilizer is tight in the slot at the spar and about 1/16-inch down at the leading edge. I have about ten degrees of right cracked into the fin, aft of the spar to achieve a turn small enough for indoor flying in a high school-sized gym. The motor is good for about 2000 turns. When you approach this amount of turns be ready for significant retrieves. This article originally appeared in the October 2000 Flying Models. To print a 1:1 copy of the plan you must have a printer attached to your computer that can print an 11 x 17 page. Some plans are 1:1 on 8.5 x 11 size paper and will be noted on the plan. If you do not have a printer, you can download and save the PDF to a disc or flash drive, then bring it to a copy center for them to reproduce.